For the Brexit movers and shakers, the past isn't what it used to be, and nor is the present. There was a time – before Gina Miller, liberal ‘remoaners’ and Commons Speaker John Bercow sabotaged everything – when Brexit Britain knew it was heading straight for the exit. But this week Theresa May has gone into full Slobodan Milošević mode, pitting the people against parliament with her populist “I’m on your side” plea. And the EU has handed responsibility back to the UK government for the chaos they’ve created. So all bets are on, and we need to ask ourselves some hard questions. 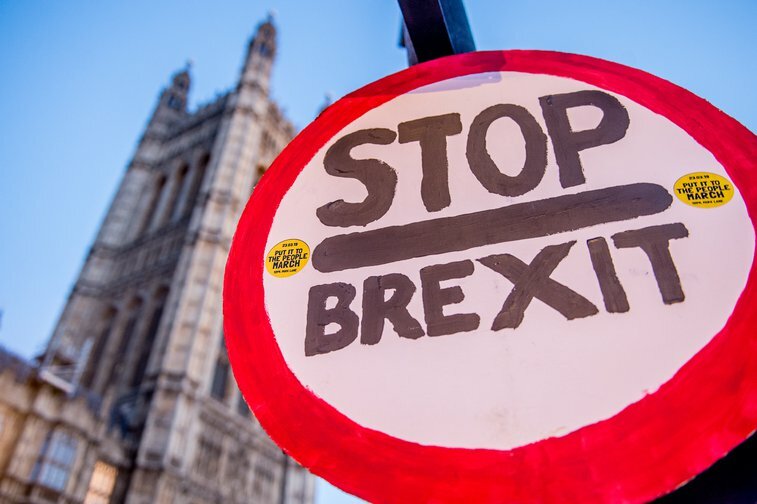 As thousands prepare for the People’s Vote march – is no-deal a real possibility, is it a dream, and how did we get into this mess? In one sense, the Brexit headbangers only have themselves to blame. Crashing to earth from a blue-sky daydream of their own making, they’ve chosen fantasy over fact every time. Three things explain their retreat into absurdity. First, Brexit was a PR campaign and an attitude, never a policy. A campaign that transformed a public who cared little for Europe into partisans, and got them to support a fuzzy cultural meme that was, as Anthony Barnett writes, “inspired by a past when, supposedly, we knew who we were and governed our own lives”. A xenophobic attitude, supported by hateful tabloid headlines, that nudged Leave over the line but left Britain’s place in the world and its colonial past unresolved. A two-and-a-half-year car crash that has left millions, especially in Remain-supporting Scotland, Wales, and Northern Ireland, asking: What is Britain for? Second, the idea of Brexit as something that can be “delivered” also has its roots in colonialism. Foreign cultures were once delivered back to Britain in the form of the museum, the exhibition and the botanical garden; forms of pedagogy by which citizens saw the Empire as a civilising instrument and economic necessity. As historian Paul Greenhalgh writes, “Empire was a commodity, a thing more important than but not dissimilar to shawls, ironwork, flax or indeed sculpture ... Countries within the empire were exhibited, as quantifiable batches of produce rather than as cultures.” And just as countries in the Empire were exploited, so countries in the EU became mere pathways for our own free trade. In 1988, in a speech opening the Single Market Campaign, Margaret Thatcher complained that “Europe wasn't open for business. Underneath the rhetoric, the old barriers remained," suggesting that Europe, in order to succeed and prosper, needed British entrepreneurial clout. This is exactly what the Brexit-makers say: that “they” need “us” to buy their commodities more than we need their mad regulations. The Germans need us to buy their cars, the French need us to buy their cheese, the Italians need us to buy their prosecco (hey, even the Russians need somewhere to launder their cash). It’s a strangely detached view, one seen through the shiny eyes of commerce, or the high windows of a colonial office. Yet this view-from-on-high ignores the fact that the EU is more than its trade policy; and it ignores the nascent European culture that exists, especially in the minds of young people. A culture committed to the rule of law rather than the rule of force from which post-WWII Europe emerged – a culture shared by a group of countries largely willing to pool sovereignty rather than squabble over it. Third, and it’s rarely acknowledged, but Britain has never been a full member of the EU. It doesn’t use the euro, it’s not in the Schengen zone, and thanks to a rebate negotiated by Thatcher, we’ve been having our cake and scoffing it for a generation. What’s more, if the economy hadn’t tanked in the late 60s, the UK might never have joined. As Fintan O’Toole writes in Heroic Failure: Brexit and the Politics of Pain, joining the Common Market was “framed for the British, not as an act of collective will, but as a collective surrender of will”; a surrender narrative that ultimately formed the soil from which today’s Euroscepticism grew. There’s a simple thought experiment to prove all this. I call it the nuke test. Just be aware of your reaction when you read these three words: English nuclear bombs. Did anything happen? To English ears the words don’t make sense, because although the threat of nuclear weapons exists largely in the past, in the context of power blocs vying for Cold War dominance, we can't think of 'our' nuclear weapons as anything other than British. But why does this matter? It matters because the UK nuclear arsenal functions – in the words of the late Harry Leslie Smith – as “viagra for an empire”. It reinforces Britain’s self-image as a powerful entity with a seat at the world table. It serves as a useful stick with which to beat Jeremy Corbyn, who has repeatedly stated his refusal to incinerate whole populations (unlike Theresa May). And it supports an English identity that cloaks itself in Britishness. Yet the Welsh and Scots don’t share this mindset, and if the Scots go for independence, the nuclear submarines currently at Faslane naval base will need a new watery home. With this in mind, as we approach the third meaningful vote, the red-white-and-blue hubris and dreams of Empire 2.0 need to be set aside. And when Theresa May loses her vote for the third time of asking, someone needs to step forward and remove the Brexit yoke that is slowly, and inexorably, tightening around this country’s future.